Any Prep for the 2 PM Legal Forum Out at Camp Ross? Hand-out sheets? Upcoming City Council March 12th – Norse Interviews Mayor 3-8 1 PM Questions for her? Wresting the $10 million from poverty pimps: News on the HEAP, HAP, or COC HQ. Council Procedure Changes Proposed? Public Agenda Meetings ? FRSC Meeting with Mayor Martine Watkins Friday 1 PM: Any Questions? Sherry Conable Memorial 7 PM Friday March 8 Peace United Church 900 High St. I joined the MLK parade, annoyed at the annual pomp and ceremony, sterilizing, sanitizing, and snoozifying his real message-to act locally against war, racism, and poverty. The flyers I distributed lay out some of the specifics that I often echo on this website. At least one speaker at the civic Auditorium noted it was, for the second year, police-led–the final bitter icing on the fluffy cake of expropriating, transforming, and degrading King’s original message and work. Almost entirely absent from the event was any discussion of local racism, police abuse, or institutional anti-homeless city policies. 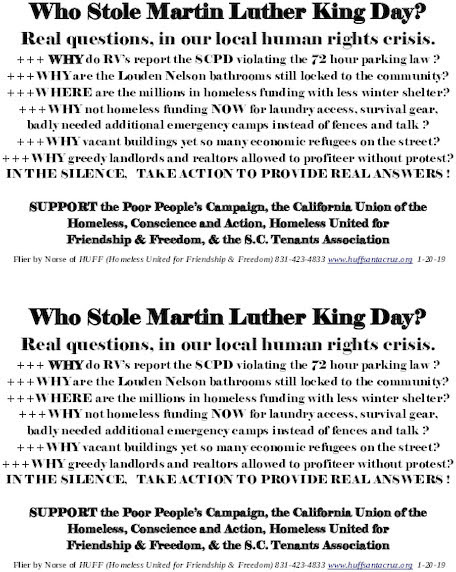 Some folks presented with flyers raising these concerns turned up their noses and marched on in bright array. I’ve raised this issue in prior parades. See https://www.indybay.org/newsitems/2018/01/16/18805901.php There were hundreds perhaps more than 1000 in the parade, but fewer on the sidelines cheering or watching than last year. I shouted a taunting inquiry at Police Chief Mills as he left Civic Auditorium. The question was also raised in Alicia Kuhl’s press conference with Chief Mills the week before: “When are you going to stop harassing the RV dwellers?” He left it unanswered, of course, as he stiffly strode away. 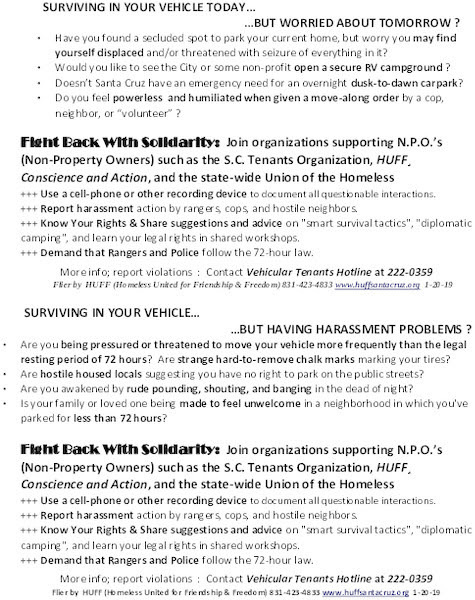 The indybay story (including the Sentinel article) covering the continuing SCPD harassment of RV’s can be found at https://www.indybay.org/newsitems/2019/01/16/18820421.php?show_comments=1#18820535 . Other activists I spoke with also mentioned the lack of local issues in the bevy of “distinguished speakers” lining the podium inside the Civic Auditorium. I regretted my own cowardice in not shouting out important questions and challenging the self-satisfied police-congratulating celebration joined in with a standing ovation. FOXES LEADING THE CHEERING CHICKENS PARADE? I continue to wonder when the NAACP–the parade co-sponsor–will stand up publicly and hold Mills’s SCPD accountable for its behavior towards poor folks and minorities. And, in particular, hold individual officers accountable publicly for abuses when they happen. Mills still declines to explain why he omits race from his infraction citation summaries. He has not responded to requests for specifics of the when and where folks were tasered, struck with a baton, choke-holded, pain-complianced, or confronted with a drawn gun. He misrepresents his Parks and Recreation Rangers use of “trespass” to load up homeless people who sleep in public parks and “closed areas” at night with unpayable fines. 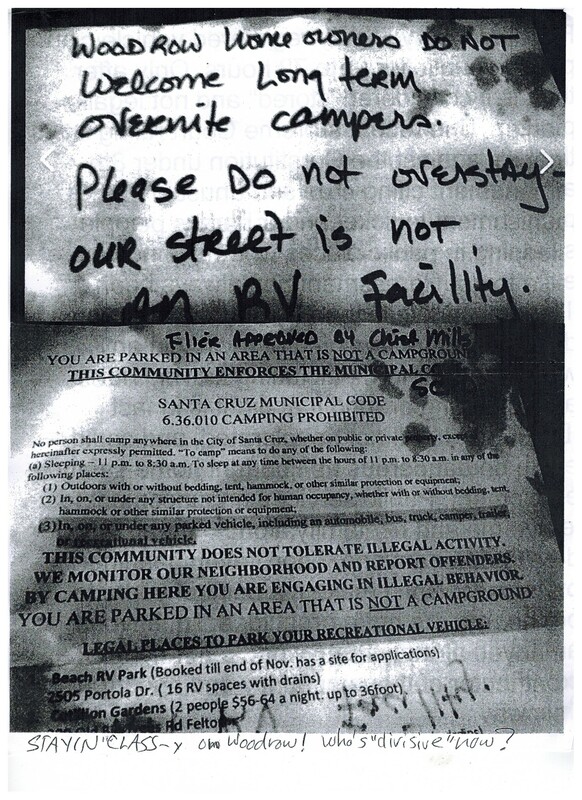 His police and rangers have been commended for generally leaving the Gateway/Ross camp alone, but most folks outside are not in that camp and must deal with harassment, citations, and property seizures for “trespassing on public property”. Over a year ago, I raised these and other questions with Mills publicly. Additionally Steve Schnaar, both this year and last, wrote questioning the consistency if not the hypocrisy of the head cop leading the MLK parade. My questions remain unanswered and his concerns haven’t been addressed either. These are behaviors that MLK, one presumes, would be exposing and resisting.. It seems particularly twisted to be allowing the SCPD to transform the event into a PR exercise–complete with little purple vests. I think we need some yellow ones here in Santa Cruz like those our French cousins are wearing as they take real, not just symbolic action. This flyer raises the questions gone into more detail on some of the other flyers. Top flyer is for those who aren’t currently being harassed, but worry about the future; the bottom flyer is for those currently experiencing harassment.